The Burmese python is the third largest snake in the world and it is a consummate hunter. It is equally at home swimming through water as it is at climbing trees, and it eats whatever that it can wrap around and swallow. While it is native to Southeast Asia, it has also been introduced to Florida and their presence has caused all kinds of ecological disruptions. Being such a large predator with a broad appetite, many native animals (including alligators) of the Everglades are at risk of becoming python food. But the Burmese Python may also be affecting the Everglades in a less noticeable manner. On their native range the python is host to a range of parasites, one of which is Raillietiella orientalis, a peculiar-looking creature that belongs to a group of parasite called Pentastomida, more commonly known as "tongue worms". These parasites are called "tongue worms" not because they live on the tongue, nor because they are "worms" as such. 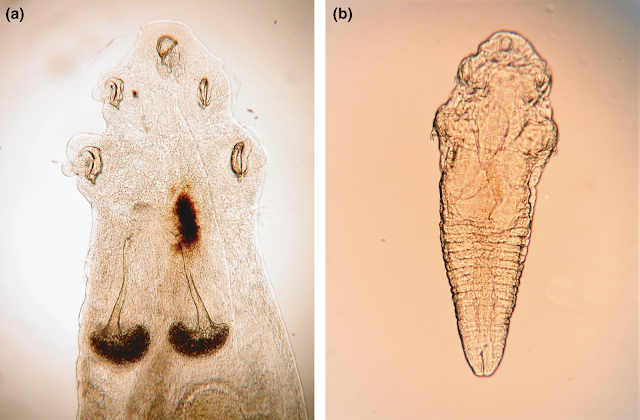 Their name comes from the appearance of the adult pentastomids which are shaped somewhat like a long tongue, and instead of being "worms", they are in fact a lineage of crustaceans that have evolved to live as respiratory tract parasites in terrestrial vertebrates, mostly reptiles. In the Everglades, Burmese Python is host to tongue worms, but where did these parasites come from? Were they brought to Florida by the Burmese python, or were they native to Florida? As it turns out, it was a bit of both. This blog post features a recently published study where a group of researchers examined the snakes of Florida for pentastomids. The sample they looked at had been collected gradually over the last decade; the Burmese pythons were either roadkills or snakes that were captured and euthanised, and all the native snakes that they examined were roadkills as to minimise the impact their study would have on the native snake fauna. In total, they looked through the lungs of 805 Burmese pythons and 498 indigenous snakes, picking out tongue worms along the way. From that mountain of dead snakes, researchers discovered that the Burmese pythons in Florida are host to two species of tongue worms - Raillietiella orientalis and Porocephalus crotali - both of which also infect the native Floridan snakes. By examining the DNA of R. orientalis, the researchers determined that the parasite did not originate in Florida. Instead it had arrived as a stowaway in the lungs of Burmese pythons. Elsewhere, R. orientalis infect a wide range of snakes from across many different families, and it seems to have take a liking to Floridan snakes as well. Wherever the Burmese pythons were found, the native snakes in the surrounding areas were also infected with R. orientalis. But in addition to bringing a new parasite to Florida, the Burmese python has also become acquainted with some of Florida's own native snake parasites. Porocephalus crotali is a parasite which infects the snakes of North and South America and is a Floridan native. It was previously thought that P. crotali can only infect vipers, but now it adds the Burmese python to its list of hosts. The presence of this parasite in those Burmese pythons shows that it wasn't as picky as previously thought. The reason why P. crotali was previously only found in vipers wasn't because they were particularly picky, but the opportunity for it to infect other types of snakes never came up - until the Burmese python arrived. So what does this mean for the Floridan snake fauna? The short answer is: more parasites. The native snakes are facing a parasite double-punch - not only did the Burmese python added another species of parasite that can infect them, but they would also be dealing with higher prevalence of the native parasite because the Burmese python is acting as an additional breeding ground for P. crotali. With so many plants and animals (and their parasites) being transported around the world on a daily basis, invasive species have become fixture in many ecosystems. As these invasive species settle into their new habitats, they also end up exchanging parasites with the native species. While this is a scenario which is being played out in many different ecosystems around the world, the ecological impact of these parasite exchanges for most habitats is still largely unknown. Miller, M. A. et al. (2018). Parasite spillover: indirect effects of invasive Burmese pythons. Ecology and Evolution, 8, 830-840.